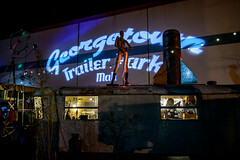 March 8th, Seattle, WA: Come down to Georgetown for the Second Saturday Art Attack for a variety of arts entertainment. This month we feature many mediums of contemporary art in a neighborhood that offers lots to do, eat, see, and drink. All City Coffee featuring Women of Equinox: Clair Putney, Lisa Geertson, M. Anne Sweet, Sophia Wheelwright, Stacy Rosevear and Syd Shera. 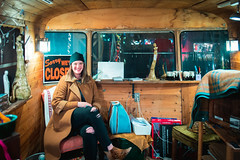 Equinox is Georgetown’s largest artist occupied warehouse accommodating over 50 tenants doing amazing work from blacksmithing and metal sculpture, to painting and ceramics, with woodwork, leatherwork, glass, photography and much more in between. These women represent a portion of the creativity emanating from the World War II era factory building located on 5th and Michigan. Calamity Janes featuring Mark Tedin, game illustrator and art instructor, presents recent works on paper for show at Calamity Jane’s in Georgetown. Color pastels and graphite portraits of costumed subjects will be showcased for the Georgetown Art Attack and throughout the month of March. Eight and Sand presents Felt Nature, the art of Mary Clymer. This is a solo installation style show of Flora in felt. 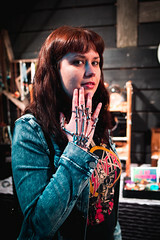 Mary is a local artist hailing from Renton, Wa. She enjoys working in fiber and experimenting with combining fiber and non fiber arts. Mary is inspired by nature, big dreams, bike rides and little mushrooms. Sarah Woodson, of Downing Pottery. Handthrown and neighborhood inflected mugs. Anne Sweet, graphic artist: feminist themes. Alex Miller, of Bizarre 1979: videographer and then some. Sherry Hussey, of Iron Idiom: glass bead making. 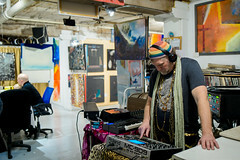 Fantagraphics Bookstore and Gallery features TONY MILLIONAIRE. Book signing and art exhibition with music by Ashley Eriksson. Exhibition continues through April 9, 2014. Georgetown Liquor Company features mixed media art by Rachel Setzer in a show titled “Pain Body”. An exploration of the anatomical body inspired by chronic pain. Each piece represents its location in the body and is intended to convey that different places hurt differently (and that each person experiences pain differently). Your pain is real, it is really part of you, no one has the right to deny or diminish it. However, just because it hurts, doesn’t mean that it’s in charge. Subject matter aided by The Anatomy Coloring Book (Wynn Kapit & Lawrence M. Elson), and series inspired by The Pain Chronicles by Melanie Thernstrom. The Georgetown Trailer Park Mall would like to apologize in advance for KARAOKE NIGHT ~ Swing by and Give the Performance of Lifetime ~ Find Your Eye of the Tiger at the Vintage & Artisan Market ~ Curated by Frida, Make Believe, Sire Vintage, Clocharde Shop & Beaver’s Den Vintage. Krab Jab Studio presents the enchanting, mythical illustrations of Stephanie Pui-Mun Law. Machine House Brewery features a yarn installation by Jessica Steffl that spans the entire length of the brewery in one area. Runway Cafe features paintings/drawings by Michael O’Driscoll who has been painting and illustrating in Seattle since 1996. His Bedbug character is now in ‘Bedbug’s Book of Wisdom’, a 40 page hardbound book of cartoons from his online Daily Cartoon postings. Spectrum House Salon & Photography presents“Peep Show” a collection of art works by pinup artist Suzy Todd. Oil paintings and watercolors of pinup queens that titillate and tease; from Rococo Hussies, to circus darlings, to sultry Lover’s eyes.